Closing out their Tri-Track Open Modified Series (TTOMS) season, teams headed to Seekonk Speedway for the ‘Haunted Hundred’. With unseasonably warm weather fans packed the grandstands and thirty-eight modified teams came to race. In the end only twenty-six qualifiers took the green and the other twelve teams sat on the sidelines. 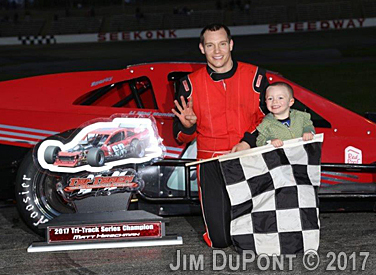 Coming into the last race, Matt Hirschman of Northampton, PA had already sealed the deal on the 2017 TTOMS Championship by winning three of 2017 series races. The unbeatable Hirschman had a bounty challenge set on him for the last race -- any driver that beat Hirschman at Seekonk would receive a $1,500 bonus. In the end though, Hirschman was not dethroned from his string of luck. He made it four for four wrapping up the series, unbeatable. He took home the bounty money along with the winning purse for his ‘Haunted Hundred’ win. It cannot be said that racers did not try to end their season with a win. Russ Hersey from Swanzey, NH passed for the top position on lap 29. He remained race leader until a tap from behind caused him to spin on a lap 90 restart. When the green flag had been thrown, drivers charged forward for the ten lap shootout. Going into turn three Anthony Nocella of Woburn, MA was pushed into Hersey from the momentum of the cars behind him. Hersey had to go to the rear because of the spin while other drivers maintained their position. Hirschman now inherited the lead with ten to go. 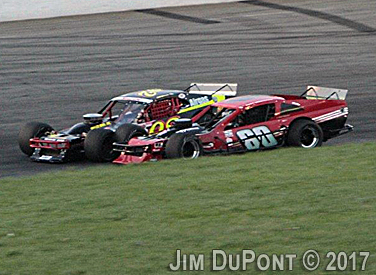 Nocella had a strong car and he was not letting Hirschman out of his sight on the last restart. He was right on Hirschman’s rear bumper from the green. On lap 97, he went to the inside taking over the lead on lap 98. With one to go Hirschman used a cross over move to get inside Nocella. The two made slight contact, righted themselves and charged forward to race end. So there was a swapping of position and hard racing between the two leaders but in the end Hirschman held off Nocella to take the checkers and his fourth TTOMS victory. Nocella started the race sixth and was collected up in an incident that brought him back close to the rear of the field. Regrouping and with a fast car under him, Nocella started his way through the field. By lap 70, He was in the top five and charging forward. On lap 90 he was behind Hersey for third on the restart. Then he was outside Hirschman for the lap 90 final restart. “I knew that it was going to be tough down to the end there. Our right rear was going away.” Stated Nocella. “We got turned around earlier in the race. I had to work my way through and I used up the tires. I knew if I had a good start on that last restart I had a shot at it. The top is not the greatest place to be. We jumped at the line and we slid up to the top of the track once. I figured with two to go I only had one shot to beat him. He (Hirschman) left the bottom open and I sailed it in and then I was up to his door in two. He got sideways and I moved him up. I did what I had to do and I did not want to spin him. He then he did what he had to do and I was up in the second groove again.” So it ended up a battle of strategy and equipment. Rowan Pennink of Huntingdon Valley, PA was consistent in practice and won the third heat race. The redraw for the top eight positions found him fourth for race start. He was involved in a caution on lap 17. He pitted, regrouped and finished the 100 laps feature third. Richard Savary and Les Hinckley rounded off the top five. Steve Masse, Andrew Krause, Keith Rocco, Ron Trees and Chris Pasteryak completed the top ten finishers. 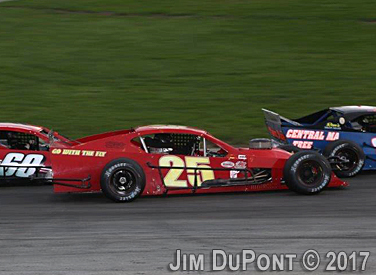 So the Tri-track Open Modified Series season ended with excitement and left fans with a thirst for more next season. We now will sit back and watch and wait for what the 2018 race season will bring. Hirschman had a perfect TTOMS season that he can now brag about. Winning all four races and capturing the championship, he was the man to beat all year. He always has been known as “Big Money Matt” and this season he lived up to the name. “It has been a great season and to have it already wrapped up the championship is great. The only way that it could have happened was to win all three. It was good to get it done at the last race. ” Hirschman had said pre-race.” Today we are starting mid-pack and we are here to try to win. Some of the other (wins) came a little easier because we drew better and today we did not draw good. We are going to see how good we can do from here.” Hirschman was in fourteenth when the initial green flag flew and used his crafty style to slowly crack into the top five by lap 40. From there it was his race to go forward and win. What were your thoughts on the bounty? Summarizing the race end and the results.